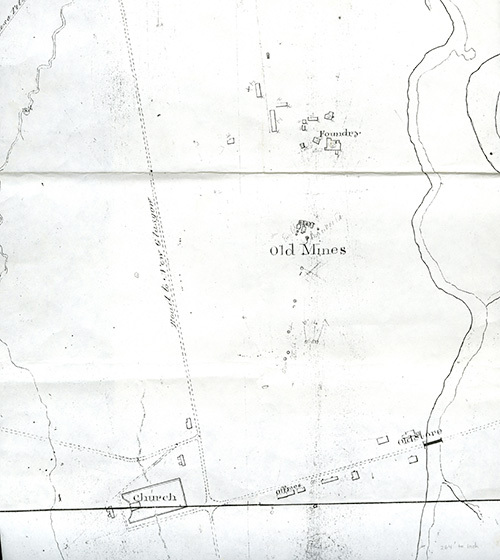 Map of part of Albion Mines showing the foundry, GMA buildings, the location of the first or “old” mines, and the Anglican church built by coal miners, c.1857. Source unknown. Stellarton, Nova Scotia, was once known as Albion Mines, named by the General Mining Association (GMA), an English coal mining company that created a coal town here in the late 1820s. We believe our site, and the adjoining area, is “ground zero” for the British Industrial Revolution’s arrival in Nova Scotia. This transfer of technology and knowledge fundamentally changed the colony. The GMA brought skilled British miners, steam engines, pumping equipment and machinery, and the money to invest in a sophisticated operation. Coal mining became an industry in Nova Scotia because of this company’s ability to go deep into the earth to mine coal in large quantities, something not done here before. 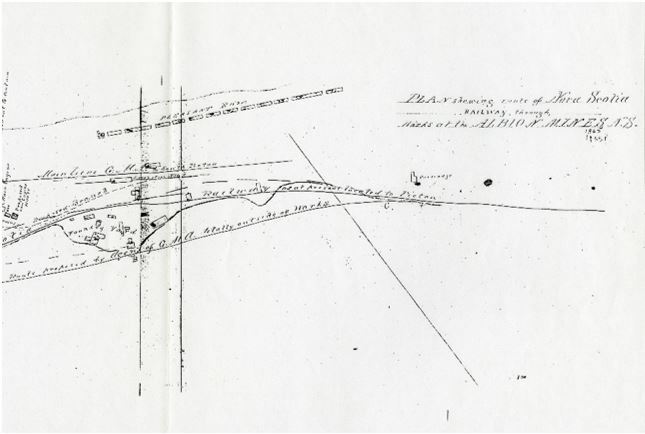 “Plan shewing (sic) route of Nova Scotia Railway through the works at Albion Mines, N.S.” Nova Scotia Archives F/239 – 1865. The foundry was an important part of this mining operation because it made parts for machines, hand tools, rails, hardware and items for the miners’ homes. It also made items for other industries in other places. The foundry poured iron, copper and brass. It was the first foundry in Canada to use coke instead of charcoal to create the heat to melt metals. The first steam engine built in Nova Scotia was made at the Albion Foundry in 1835. 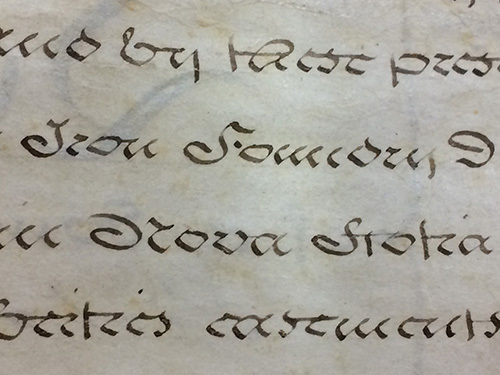 Detail from William Davies’ lease of the Albion foundry, an impressive, but difficult to decipher document found in the oversize collection of the Nova Scotia Archives. That same year the foundry was leased to William Davies for five years. The foundry flourished under his leadership. By 1841 a local newspaper described it as having “casting houses, fitting shop, Pattern Making shop, Blacksmith’s shop, Engine house and Saw-mill; with two smelting cupolas for iron, one for copper and brass, also a large reverberatory Air Furnace, (capable of smelting five tons of pig iron at one time), a drying stove, powerful crane, etc. ….” (The Mechanic and Farmer, Pictou Sept. 1, 1841). It employed over 100 people in a variety of jobs. Davies operated the foundry until 1855 when he moved to Pictou and opened a foundry there. The date the Albion Mines foundry ceased operation is unknown.